Three important questions have to be considered, when diagnosing pathologic conditions in the dentition. The first question concerns heredity. Has the pathologic condition a congenital background or is it acquired? If the condition is acquired, the second question is a “why-question”. What is the etiology? Traditionally the clinicians describe where the condition is located, and how it appears morphologically. When the condition arose is also in focus. But the etiology important for the optimal treatment is often difficult to explain from the patient record. The third important question, when analyzing the pathologic condition is how this condition interferes with normal development. In other words: Can this specific pathologic case add new information to normal developmental processes? The present case focuses on these three questions and demonstrates how the etiological “why-questions” can be explored as a background for suggesting a hypothesis. This complicated case is of a girl now 14 years of age. When the girl was 8 years old, the dentist took a dental radiograph [Figure 1] and noticed a short mesial root on the first right mandibular molar. When the girl was 10 years of age, a bitewing was taken for caries diagnostics [Figure 2]. The dentist noticed that the contour of the distal root at the first mandibular right molar had a concavity. 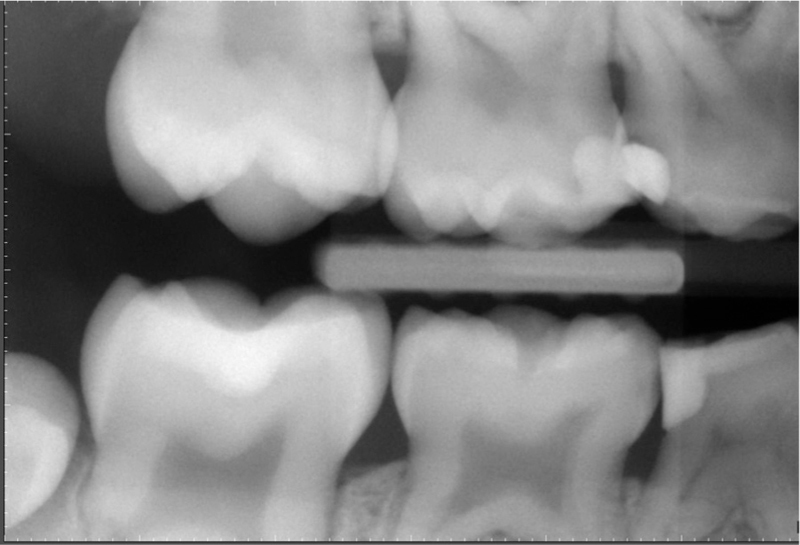 For further examination of the dentition, a panoramic radiograph was taken [Figure 3]. This radiograph demonstrated that even the second premolar and second molar in the right side of the mandible were abnormal. Arrested root formations on the first molar and the second premolar were observed. Compared to the contralateral side, both teeth had smaller crowns and shorter roots. 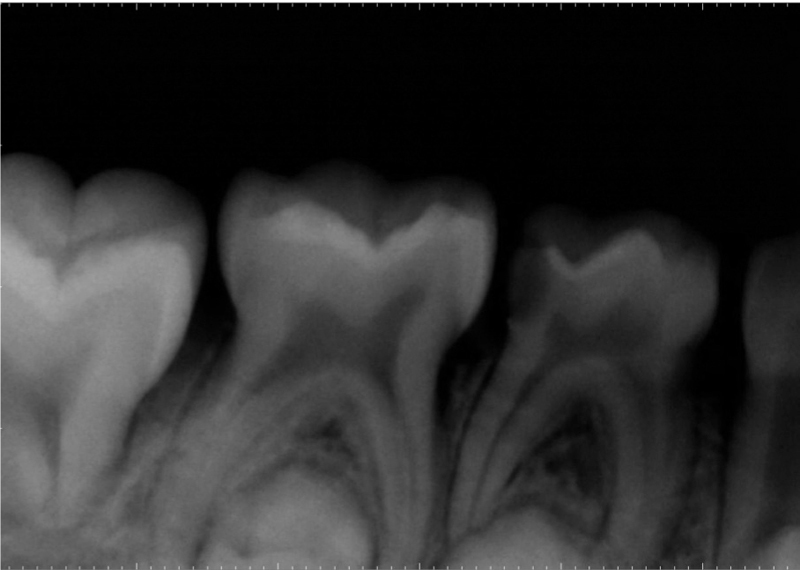 Not only the root length was shortened in the second molar but also the apical root membrane seemed to be missing. This observation resulted in a referral to the Department of Pediatric Dentistry for further examination and treatment planning. The dental record was analyzed. The anamnestic information reported that the girl was healthy. It was noticed in the record that she at the age of 1 year and 2 months fell into a high cactus. According to the anamnestic information, the girl had about 1000 cactus pins in her face and body. These pins were removed in general anesthesia including intubation. Several pins were left behind because they were soft. Questions that arose from this accident were many and among these the following four concerned etiology. Question 1. Could this abnormal condition in the right side be considered as a congenital condition or is it an acquired condition? Question 2. Could these cactus pins have caused the abnormal dental conditions in the right side due to infection or eventual poisoning? Question 3. Could the anesthesia have caused this condition? Question 4. Could the intubation be responsible for the right-sided dental deviation? There were no real answers to these questions. For observation of the situation and for the clarification of the etiology, a panoramic radiograph was taken a year later [Figure 4]. It was obvious that the abnormal root formations of the two molars and one premolar in the right side of the mandible had not changed, while normal dental development had occurred in the remaining dentition. The crown morphology and the length of the root of the affected teeth were the same as the year before. The first permanent molar was still in the correct occlusal level (correct postemergence continued eruption) and the second premolar had started resorbing the overlying primary molar. The second molar had erupted and was located more occlusally than the second molar in the contralateral side. A third molar in the right side of the mandible was not visible [Figure 4]. 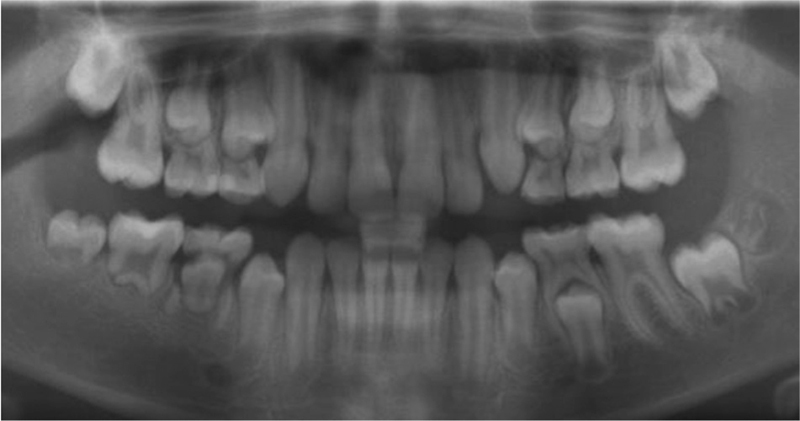 A follow-up 2 years after the referral is demonstrated in a new panoramic radiograph [Figure 5]. It appeared that the second premolar had resorbed the second primary molar and erupted to the occlusal level. The remnants of the roots of the second primary molar persisted. The affected second molar had reached normal occlusal level and a third molar in the right side of the mandible had still not appeared. The mental foramen in the right side of the mandible appeared large and distinct (compared to the contralateral side). 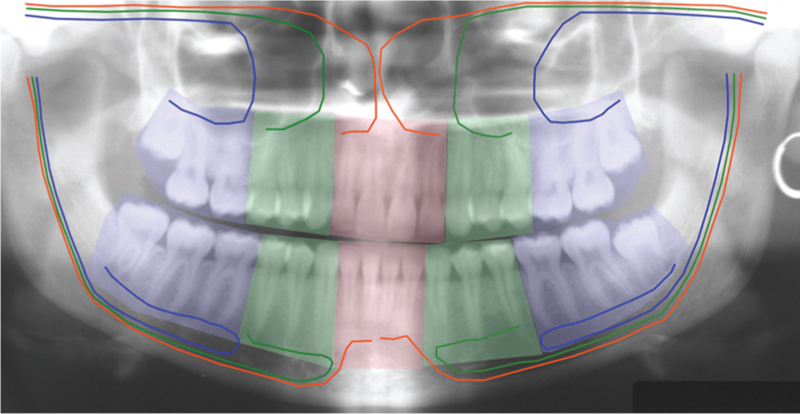 The root length of the affected teeth had not changed since the first panoramic imaging [Figure 3]. The questions were now if these 2 years of observation of the dentition could clarify the etiology. Five new questions were raised. Question 5. How could the second premolar and the second molar in the right side erupt normally and seemingly earlier than in the contralateral side? Question 6. Can the absence of the third mandibular molar in the right side be considered as agenesis or is this absence caused by the accident described in the right mandibular side? Question 7. Is it possible that the accident has caused the smaller crown size of the second premolar and the second molar? Question 8. How could a seemingly normal resorption of the primary molar occur? Question 9. Is the short root length in the right side caused by resorption or is it caused by a disruption in the tissue types at the time when the accident occurred or years after this accident? The evaluation of the etiology of the condition in the right side of the mandible, based on these dental findings, is presented in the discussion section. Preserve the affected teeth as long as possible. Perform an autotransplantation of a third molar to the region of the second molar at the age of 17. Implants as compensation for the loss of second premolar and the second molar might be a future perspective. The treatment plan was suggested without knowledge about the etiology of the developmental disturbances. Etiology-based diagnostics might in this case have improved the treatment plan However, the treatment plan took into account the process of the tooth development and eruption. These tissue types are demonstrated in two orthopantomograms in [Figure 6] and [Figure 7]. Epithelium [Figure 6]: If the dental deviation observed in the present case was congenital due to abnormal epithelium, then all teeth would have been affected. This is not the case. Therefore, the condition, evaluated from the perspective of the epithelium, is acquired. Innervation [Figure 7]: If innervation had a congenital defect, the eruption process (depending on the innervation of the root membrane) would not have been normal. From an innervation point of view, the condition is therefore acquired. Furthermore, the innervation of the teeth occurs in fields [Figure 7] with different innervation paths. Dental malformation in the present case does not appear within fields, and therefore the present case is not related to innervation pattern. In addition, from this point of view, the condition is acquired. As a conclusion, this severe arrested root formation case seems to be caused by a locally disruption of ectomesenchyme which has involved root formation (short root) and bone formation (visible mental foramen). As the outer layer of the crown follicle is composed by ectomesenchyme for the preservation of the inner pressure in the crown follicle, this layer regulates the size of the crown. A local disruption of ectomesenchyme influencing the pressure in the crown follicle might therefore have caused the small crown size of the second premolar and the second molar. When the girl was 1 year and 2 months old, the first mandibular molar would not have developed a half root length and fully developed crowns of the second molar and second premolar, according to normal dental maturity. The period when arrestment in the root development arose in this case seems to be 2–3 years later than the accident. However, the small crowns of the second premolar and the second molar seem to be caused at the age between 1 and 2 years and not before this age period, as the crown morphology and crown size of the first permanent molar formed before the age of 1–2 years were normal. It could be hypothesized that the accident caused a regional inflammation or poisoning immediately, which has changed the pressure in the crown follicles resulting in the narrowing of crowns. It could also be hypothesized that the inflammation persisted in the region for a longer period, arresting the root development. This cannot be proven. The case is usable in the evaluation of the normal eruption process and resorption process and demonstrates clearly that the teeth are not dependent on gain in root length for eruption. It also demonstrates that innervation important for the eruption process is seemingly normal in this case. The question of agenesis of the third molar cannot be solved, but inflammation might have disturbed the early tooth bud in this region. A detailed analysis of the dentition in this very rare case with severe arrested root formation demonstrates that the condition is acquired. The cause could be related to a local inflammation after the fall into a cactus and the following medical and operational treatment procedures. Other explanations not known could also be possible. It demonstrates how the teeth without roots or with short roots can erupt normally and even earlier than the contralateral teeth. Furthermore, it is demonstrated that a second premolar with short root is able to resorb the overlying primary molar. Kjær I. Etiology-based diagnostics for improvement of treatment. Dent Hypotheses 2016;7:31-3. Kjær I. External root resorption − Different aetiologies explained from the composition of the human root-close periodonatal membrane. Dent Hypotheses 2013;4:75-9. Kjær I. Etiology-Based Dental and Craniofacial Diagnostics. Wiley-Blackwell; 2017. Andersen E, Skovgaard LT, Poulsen S, Kjær I. The influence of jaw innervation on the dental maturation pattern in the mandible. Orthod Craniofac Res 2004;7:211-5. Kock G, Kreiborg S, Andreasen JO. Eruption and shedding of teeth. In: Kock G, Poulsen S, Espelid I, Haubek D, editors. Pediatric Dentistry. A Clinical Approach. 3rd ed. Oxford: Wiley-Blackwell 2017. p. 40-54.